This article is about the city in Belize, Central America. For other uses, see Belize (disambiguation). Belize City was founded as "Belize Town" in 1638 by English lumber harvesters. It had been a small Maya city called Holzuz. Belize Town was ideal for the English as a central post because it was on the sea and a natural outlet for local rivers and creeks down which the British shipped logwood and mahogany. Belize Town also became the home of the thousands of African slaves brought in by the English (later the British, beginning in 1707) to toil in the forest industry. It was the coordination site for the 1798 Battle of St. George's Caye, won by the British against would-be invaders, and the home of the local courts and government officials up to the 1970s. For this reason, historians often say that "the capital was the colony", because the center of British control was here. This sentiment remains true today. Even though people like Antonio Soberanis, George Price and Evan X Hyde all lobbied to take their movements outside, and other ethnic groups such as the Garifuna and Mestizos sprang up elsewhere in the country, people looked to Belize Town for guidance. Belize City has been directly struck by two hurricanes since 1900, the 1931 hurricane and 1961's Hurricane Hattie, and at various times areas of the city have burnt down, the most recent being the 1999 Albert Street fire that burnt out Mikado's, and a 2004 fire that destroyed the Paslow Building. The city was also hit hard by Hurricane Richard in 2010 and by the 2016 Hurricane Earl. Fires on Northside and Southside have burnt out great stretches of housing, but the fire department was able to quench most of these. The city is also susceptible to flooding in the rainy season. Belize City spreads out Mile 6 on the Western Highway and Mile 5 on the Northern Highway, at the Haulover Bridge. The city proper is usually divided into two areas: Northside, bounded by Haulover Creek and ending in the east at the Fort George area, and Southside, extending to the outskirts of the city and the port area including downtown. Politically, it is divided into ten constituencies. Freetown, the westernmost constituency on Northside, is home to the Belama, Coral Grove, Buttonwood Bay and Vista Del Mar suburbs. Within the city proper it extends up to around the former Belize Technical College area. Caribbean Shores includes Kings' Park, a small suburb north and west of Freetown Road, West Landivar, home to two of the University of Belize's three city campuses, and residential University Heights. Pickstock inhabits the banks of the Haulover Creek extending to Barrack Road. St. John's Cathedral stands on the southern end of Albert Street. St. John's is the oldest Anglican Church in Central America, and one of the oldest buildings in Belize. The orange bricks came to Belize aboard British ships as ballast. Construction began in 1812, and the church was completed in 1820. St. John's is the only Anglican cathedral in the world outside England where the crowning of kings took place. Fort George is perhaps the most colonial area in the city and contains Memorial Park, the Baron Bliss Grave and Baron Bliss Lighthouse and the Museum of Belize. On the Southside, Lake Independence, Collet and Port Loyola are home to some of the city's poorest residents. "London bridges", rickety wooden pallets linking dwellings, and low-strung poles are not uncommon here. On the east side of Central American Boulevard are Mesopotamia, Queen's Square and Albert, which are slightly better. Albert contains the downtown streets of Albert and Regent Streets. The Swing Bridge in Belize City is the only functioning, manually operated swing bridge in the world. The divisions of the city are linked by four bridges: the Swing Bridge, at Market Square and North Front Street; the Belchina Bascule Bridge at the Douglas Jones Street and Youth for the Future Drive junction; the Belcan Bridge linking Central American Boulevard and the roundabout leading to the Northern Highway and Caribbean Shores, and a recently built fourth bridge linking Fabers' Road and the southern Lake Independence/Port Loyola area to the Belama and northwest suburbs of the city. Numerous smaller bridges link individual streets. The three main canals running in Belize City, are Haulover Creek, Burdon Canal and Collet Canal. All of them run through Southside. The city is served by Philip S. W. Goldson International Airport, in Ladyville, northwest of Belize City, and by Belize City Municipal Airport, within the city itself. Belize City features a tropical monsoon climate, with warm and humid conditions throughout the course of the year. The city has a lengthy wet season that runs from May through January and a short dry season covering the remaining three months. However, as is the characteristic of several cities with tropical monsoon climates, Belize City sees some precipitation during its dry season. March is Belize City's driest month with only 48 mm of precipitation observed, a somewhat unusual month for a city with this climate type. Typically the driest month for a city with a tropical monsoon climate is the month after the winter solstice, which in Belize City would be January. Average monthly temperatures remain relatively constant throughout the course of the year, ranging from 23 °C to 28 °C. Belize City has more educational institutions at every level than any other city in Belize. Most city children in Belize attend high school. The only three schools that are not coed are on the Northside: Saint John's College (boys), Saint Catherine's Academy (girls) and Pallotti High School (girls). One Southside school that was previously all girls, Sadie Vernon Technical (Belize Continuation), recently integrated. There are three other private schools in Belize City: Belize Elementary School and its continuation Belize High School behind it, both on Princess Margret Drive, and the Hummingbird Elementary School. 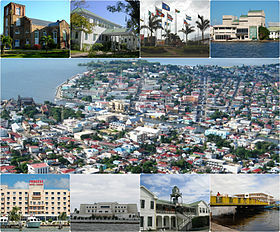 Belize City's culture is considered similar to that of Caribbean capital cities such as St. George's, Grenada, or Georgetown, Guyana. Always busy in the daytime, the city has the hustle and bustle one would associate with a city of 70,800. Notable cultural events include Garifuna Settlement Day (November 19), Belize City Carnival (September), Baron Bliss Day (March 9). Museums in the city include the Bliss Institute, Image Factory Art Foundation and Gallery, the Maritime Museum and the Museum of Belize. There is an annual Street Art Festival. The majority of working Belizeans travel to work in downtown offices or else ply their trade on the street sides. Belize City is home to branches of all the major banks of Belize and the Central Bank, as well as nearly all insurance centers, marketplaces and the like. Belize City is the hub for both national and international air, sea and road travel. Belize City is operated by a mayor-council form of government. The Belize City Council is composed of 10 councillors (generally reflecting the ten constituencies of Belize City) and a mayor, all elected in municipal elections held every third year in March. After the most recent municipal elections in 2018, the current mayor is Bernard Wagner of the People's United Party. The city is also home to the House of Culture, formerly the official residence of the Governor-General of Belize until 1984. The Supreme Court of Belize still sits in Belize City. In 2010 the total population in Belize City North Side was 16,116 (7,620 males and 8,496 females), with 5,078 households and a 3.2 average household size. The total population on the South Side was 37,416, 18,266 males and 19,150 females. with 11,078 households and a 3.4 average household size. ^ "Belize City, Belize". Google Maps. Retrieved August 20, 2011. ^ a b "History". Belize City Council. Retrieved July 11, 2014. ^ a b "Population Data – Census 2010". Statistical Institute of Belize. Archived from the original on March 4, 2014. Retrieved February 27, 2014. ^ "Belize: Districts, Towns & Villages - Population Statistics, Maps, Charts, Weather and Web Information". www.citypopulation.de. Retrieved March 28, 2018. ^ "belmopanbelize.com". belmopanbelize.com. Archived from the original on July 22, 2010. Retrieved June 29, 2010. ^ a b "Ambergris Caye, Belize History". Retrieved February 23, 2013. ^ a b "Ayuso, Mateo, "The Role of the Maya-Mestizo in the Development of Belize", in Belize Ethnicity and Development, papers presented at the First Annual Studies on Belize Conference, May 1987, Society for the Promotion of Education and Research, Belize". Retrieved February 23, 2013. ^ "Climatology Information for a few stations across Belize". National Meteorological Service of Belize. Archived from the original on October 13, 2016. Retrieved August 2, 2016. ^ "Station Philip Goldson" (in French). Meteo Climat. Retrieved November 6, 2016. ^ "Klimatafel von Belize City (Int. Flugh.) / Belize" (PDF). Baseline climate means (1961-1990) from stations all over the world (in German). Deutscher Wetterdienst. Retrieved January 24, 2016. ^ "Station 78583: Belize/Phillip Goldston INTL. Airport". Global station data 1961–1990—Sunshine Duration. Deutscher Wetterdienst. Retrieved July 9, 2015. ^ "The Daily Northwestern : Evanston maintains strong ties to its sister city in Belize". The Daily Northwestern. ^ "Interactive City Directory". Sister Cities International. Archived from the original on March 1, 2016. Retrieved February 20, 2016. 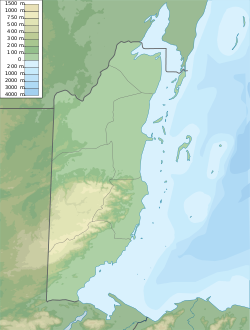 Wikimedia Commons has media related to Belize City. Wikivoyage has a travel guide for Belize City.